What areas are covered by KOS van routes? What currency are prices quoted in? Can I try out goods in store before I buy? Do I have to pay VAT if I am taking the goods outside of the Republic of Ireland? Does my order arrive fully assembled? 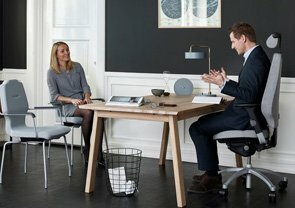 Can I have my chair set up and delivered to my premises? 1.What areas are covered by your van routes? KOS Ergonomic Solutions own vans cover the main urban centers, Dubin, Cork and Limerick at least weekly. Areas close to the M8 are also covered weekly. The entire island of Ireland is covered by our national courier. 2. What currency are prices quoted in? The prices on this website are quoted in euros exclusive of VAT. If you hover over the figure you will also see the inclusive of Vat price. 3. How can I pay for my online order? We accept MasterCard, Visa and Laser. Payment can also be made by bank transfer or by cash in advance. 4. Can I try out goods in store before I buy? A private viewing can be arranged at either of our showroom in Holycross, Co. Tipperary or in Dublin city. Please contact us to arrange a viewing. 5. Can my delivery address differ from my billing address? We can send to a delivery address different to the billing / invoice address, but a landline number is required for the delivery address and we will not deliver any product until the alternative address has been confirmed on the landline provided. 6. Do I receive an Order Confirmation? You will receive an order confirmation email as soon as you have placed an order. 7. When will I be charged for my goods? You will be charged immediately upon clicking your acceptance in the Checkout, subject to approval by your credit card company or bank. 8. What is the availability of an item? Most items are usually ready for dispatch within 48 hours. Items with a longer lead time will be indicated on the product page, with an approximate lead time. Please note that these delivery times are approximate only and should only be considered advisory. In the unlikely event that any of the items you have ordered are out of stock or discontinued by the supplier we will contact you as soon as possible. 9. What is our pricing policy? We do our best to ensure that all prices on our web site are up to date and current at all times.· We do however reserve the right to withdraw the product from sale at the incorrect price and cancel your order. 10. Can I cancel my order? If you wish to cancel an order for a stock item, you may do so by contacting us. You must do this as soon as possible and in the case of orders that have a quoted delivery time of less than 7 days cancellations must be made within 4 hours of placing the order. All such cancellations will incur a cancellation fee of 20% for re-stocking and administration. If the order has already been sent out to you, we would request that you return the goods to us once they have been delivered, following the instructions within Deliveries & Returns. Please note: If an item is personalised or made to measure, such orders cannot be cancelled. 11. Can I change my order? If you wish to make any other changes to the order, such as amending the delivery address or adding or deleting items, please use the email form on the contact us page within 4 hours of placing the order. 12. Do I have to pay VAT? 13. Do I have to pay VAT if I am taking the goods outside of the Republic of Ireland? All goods purchased from us and shipped to individuals within the EU must include VAT at the Republic of Ireland· rate. VAT is not charged on goods sent to EU companies if that company is registered for VAT and supply us with their VAT number. 14. What are your delivery charges? KOS Ergonomic Solutions’ delivery charges for standard sized items are 8.99 euros per order, regardless of the number of items on the order throughout the island of Ireland. PLEASE NOTE: Delivery charges quoted are ground floor delivery, Monday to Friday during normal working hours. For larger items the delivery charge is 29.00 euros per order.· if a larger item is purchased with a standard item, one delivery charge of 29.00 will be charged. We can quote for overseas delivery on request, please contact us. 15. Does my order arrive fully assembled? Most small items (i.e. keyboards, cushions etc) are delivered fully assembled. Items such a desks and chairs are delivered unassembled (to prevent damage occurring in transit). Please ask upon ordering if you have a preference for assembled or unassembled and we will give you advice on the options available. We can assemble furniture at time of initial delivery if you are located close to our van delivery routes. To get a price for installation of a product please contact us before ordering and we will be happy to give you an accurate quote. 16. Can I have my chair set up and delivered to my premises? Onsite chair fittings are available, by request. An additional charge may be applicable for this service depending on the location. We also provide phone support for chair set-up queries free of charge. 17. How is my order delivered? Larger items will be delivered by our delivery fleet if customer is located close to our van routes. Outside these areas, a national carrier will carry out deliveries. Deliveries are Monday to Friday during trading hours only. When goods are delivered, the customer, by accepting and signing for the goods, undertakes that they were received in good condition. This means that, if the customer finds damage AFTER accepting and signing for the goods, then any damage caused in transit is the responsibility of the customer. It is therefore very important that the customer checks for any signs of damage that may have occurred in transit BEFORE accepting the parcel; if any is detected, the customer should refuse to accept the delivery and inform us immediately and we shall arrange for a replacement to be sent as soon as possible. 18. When will my order be delivered? An approximate delivery date is given for each product that you order. Very occasionally, circumstances beyond our control can delay this date. If this happens, we will endeavour to keep you informed. We cannot, however, accept liability for any loss or inconvenience that may result from the delay. If we have agreed a delivery date, and you are not present when we arrive, we can reschedule a delivery for the next available date. There will be a charge for the subsequent delivery, even if the first delivery was free.